Do you need a house clearance in Islington N1? We have the perfect solution! 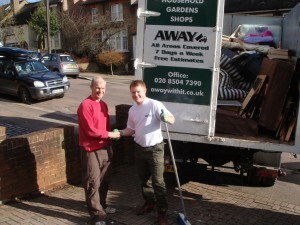 We have been delivering house clearance Islington residents depend on for over ten years. 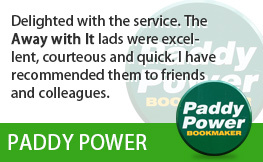 They love our prompt, convenient and expert services and reasonably priced prices and we’re confident you will as well! There are plenty of reasons why you could be looking for house clearance services in Islington. You may be wanting to put your home on the market or just need more space. Perhaps you’re sick of being surrounded by piles of clutter and junk? Or having to leave your car parked on the drive in all kinds of weather because you can’t get in the garage? Possibly you have just recently lost a close family member and need to clear their personal belongings in order that the house can be put on the market? 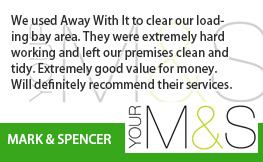 No matter what your reasons Away With It can supply a stress free, first class house clearance service that’s the ideal solution for your needs. 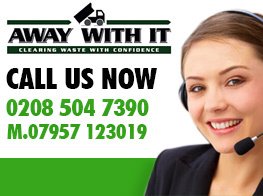 We are authorized waste carriers so you can depend on us to carry out a professional job and get rid of any junk we remove lawfully and responsibly. 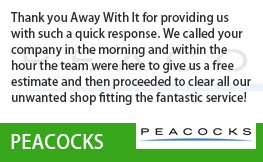 We will always work closely with you to make sure that the job is carried out with the very least disruption and that only unwanted objects are cleared away. 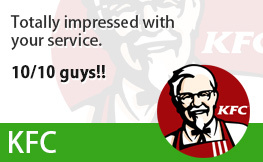 When you call to book we will give a free estimate that includes all labour, transportation and disposal charges. We will then carry out a visual inspection and confirm the price when we arrive at your property. There won’t be any unpleasant shocks in the form of supplementary charges and no call-out fee either if you decide you don’t want to proceed. Booking is in 2 hour slots and we always do our utmost to offer early morning, weekend and evening appointments if more convenient for you. We will always phone an hour ahead to let you know our precise arrival time . 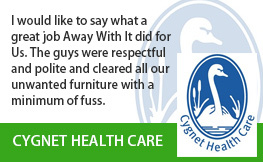 When the job is done we will tidy up and leave your property spick-and-span. To discuss your needs for house clearance Islington give us a call on 0208 504 7390 or 07957 123019. We are standing by to take your call 7 days a week any time between 7am and 11.30pm. 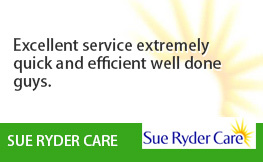 Our expert team will be delighted to answer any questions you may have and provide a free no obligation estimate. Alternatively you can provide your details using our quick and easy online enquiry form and we’ll respond to you promptly.